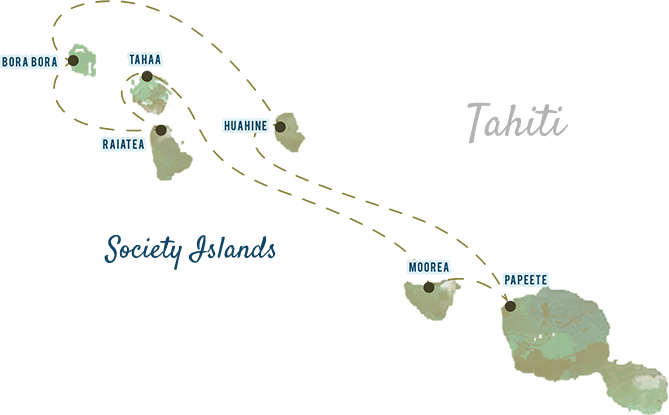 See More of Tahiti on Windstar - Fugazi Travel Agency Inc. If you haven’t seen one Tahitian island, let alone six, now is your perfect opportunity aboard a luxury sailing yacht. Depart from Los Angeles (LAX) and set foot in Tahiti in only eight hours. Then, step aboard Wind Spirit, a luxury yacht that takes you to the most serene destinations in Tahiti. Experience intimate harbors, crystal-clear coves, and pristine white sands massaging your every step. The islands of French Polynesia invite you to discover their own distinct magic. AND AIR + HOTEL PACKAGES ARE LIMITED. See the best of Tahiti in seven days. Embark on drift snorkeling excursions among coral gardens in Tahaa. Explore the majestic palm-fringed Three Coconut Trail in Moorea. And indulge in Bora Bora’s kaleidoscope of colored seas and stunning white-sand beaches. ​Your private island celebration on the beach promises to be an extraordinary event with a menu carefully selected by Windstar’s executive chef and Polynesian fire dancers displaying their artistry and local traditions. Enjoy sunny Fakarava, one of earth’s most beautiful places that’s been named a UNESCO Biosphere Reserve. Discover rare species of nesting birds and marine life living in harmony and immerse yourself in Tahiti’s authentic experiences.